We are very excited to announce that the macchina of Alfa Romeo is our 2019 Proiettore Macchina!! Alfa Romeo has been selected as our 2019 Proiettore Macchina. We will also be hosting the "Cortile della Corsa", the "Courtyard or Racing" which is the theme for the 2019 Alfa Romeo Owner's Club North American Convention which is being held on the Cortile showfield! Make plans to join us this July 16th through 21st for the Alfa Romeo Owners Club (AROC) 2019 Convention. 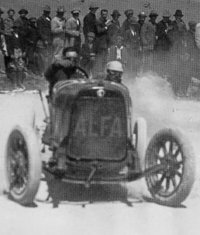 Alfa Romeo will also be the Spotlight Car of the Pittsburgh Vintage Grand Prix and the Proiettore Macchina of the Cortile Italian Car Show. To learn more about the list events for the Alfa Romeo Owners Club, and to register for them, click HERE or on the "Cortile della Corsa" logo.